Deer Scram Repellent Review: An Effective Granular Deer Repellent! 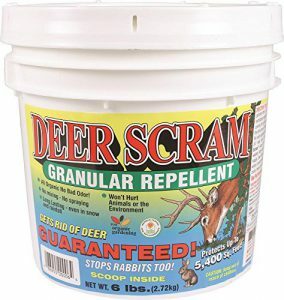 Unlike most of the natural deer repellents that we review on this site which are liquid in nature, Deer Scram Repellent is a very effective granular deer repellent. Rather than being sprayed directly on plants, it is sprinkled around the perimeter of the area you’re looking to protect. This creates a barrier that deer will not care to cross. The manufacturer claims that this repellent lasts significantly longer than sprayable repellents and is far more convenient to apply. In addition, there is a full money-back guarantee if you are not content with the performance of this product. Below we will provide you with some of the product features, Deer Scram reviews and where to buy Deer Scram. The granular nature of this product means there is no mixing of concentrates or spraying to apply. There is no noticeable or foul odor like some of its sprayable competitors. This organic deer repellent uses all natural ingredients to repel dear. After its effective life is over, it will biodegrade into high nitrogen organic nutrients. As stated before, Deer Scram creates a barrier to prevent deer from accessing your plants before they have an opportunity to taste them. It does this by simulating the smell of their dead kin to elicit a fear response. This product should be applied every 30 to 45 days depending on the weather. It is resistant to both rain and snow. In addition, it has proven to be effective against rabbits. Deer Scram comes in a variety of sizes but the 6lb pail is one of the better values. A scoop is included to make distributing the product easier. For more information on this product and frequently asked questions, please visit Deer Scram’s FAQ page. Over 70% of Deer Scram reviews are between 4 and 5 stars on Amazon. People find that this granular deer repellent is far easier to apply than its sprayable counterparts. It has done a wonderful job at creating a barrier that deer refuse to cross. Their crops are growing unimpeded and flourishing as if there were no deer in their area. This product has become an utmost necessity to gardeners all over. It provides all of the insurance they need to make sure their desirable plants aren’t destroyed by deer. Furthermore, people love that this is an organic deer repellent. They are comforted by the fact that they are not putting harmful chemicals around their plants, pets, and families. Overall, reviewers are quite satisfied with the performance of this product. Deer Scram Repellent is one of our most favorite natural deer repellents on the market. We like the unique, convenient application method of simply sprinkling it on the ground. In addition, we love the fact that it’s made from organic ingredients and has a money-back guarantee from the manufacturer. Deer Scram is a wonderful granular product that should keep deer away from your gardens for good! We wish you the best of luck with getting rid of deer using this awesome product! See the link below for where to buy Deer Scram. Please feel free to leave comments below! Liquid Fence Deer Repellent Concentrate Review: You Won’t be Disappointed! Ortho Deer B Gon Concentrate Review: Stop the Deer Damage! I Must Garden Deer Repellent Concentrate Review: A Great Way to Scare Deer Away! I’m a new fan of Deer Scram; it has really worked to keep our plants from being eaten by deer! But I have one comment/question: I’ve noticed several “burned” spots in the grass where we’ve sprinkled the Deer Scram. I speculate that perhaps some animal might have peed there, possibly to mask the smell of the Deer Scram? Aside from that, the other areas where we’ve applied Deer Scram actually have greened up nicely, demonstrating Deer Scram’s secondary effect as a nutrient. Have any other users reported having a similar issue with burned spots? We haven’t heard of other users experiencing issues with “burn spots” on their lawns. This could be the result of many different things so it’s hard to say what’s causing it. For example, I’ve experienced a few burn spots on my lawn from where clumped up grass clippings were allowed to sit on top of fresh grass and suffocate it. We’re glad to hear that Deer Scram has been working for you and hope for your continued success! In all honesty, this is the first instance of “burn spots” that we’ve heard of. It is most likely due to something unrelated to Deer Scram or perhaps improper application. People generally have favorable results with this product without the aforementioned burned grass. Hope this helps! 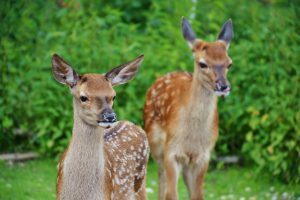 The Best Deer Repellent Reviews: Keep Deer Out of the Vegetable Garden! The Best Deer Whistles for Cars: Helping You Avoid Deer While Driving! Repellex Systemic Deer Repellent Tablets Review: A Unique Way to Repel Deer! 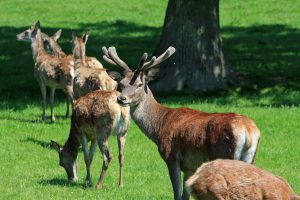 The Best Deer Netting for Gardens: Stop Deer from Eating Plants! 10 All Natural Deer Repellents That Work: Forget About Homemade Deer Repellent Recipes! Deer Maven on A Great Ultrasonic Deer Repeller: The Hoont Animal Repeller! Deer Maven on The Best Deer Whistles for Cars: Helping You Avoid Deer While Driving! donna on A Great Ultrasonic Deer Repeller: The Hoont Animal Repeller! Katrina on The Best Deer Whistles for Cars: Helping You Avoid Deer While Driving! Deer Maven on Ultrasonic Deer Repellent Reviews: The Only Ones Worth Considering! Al Harris on Ultrasonic Deer Repellent Reviews: The Only Ones Worth Considering! CherylWolfe on Ultrasonic Deer Repellent Reviews: The Only Ones Worth Considering! Deer Maven on Pest Soldier Sentinel Review: The Best Ultrasonic Deer Repellent! Dealing with Deer Copyright © 2019.